Pumpkins…the fall treat for potbellied pigs! Halloween is almost here! 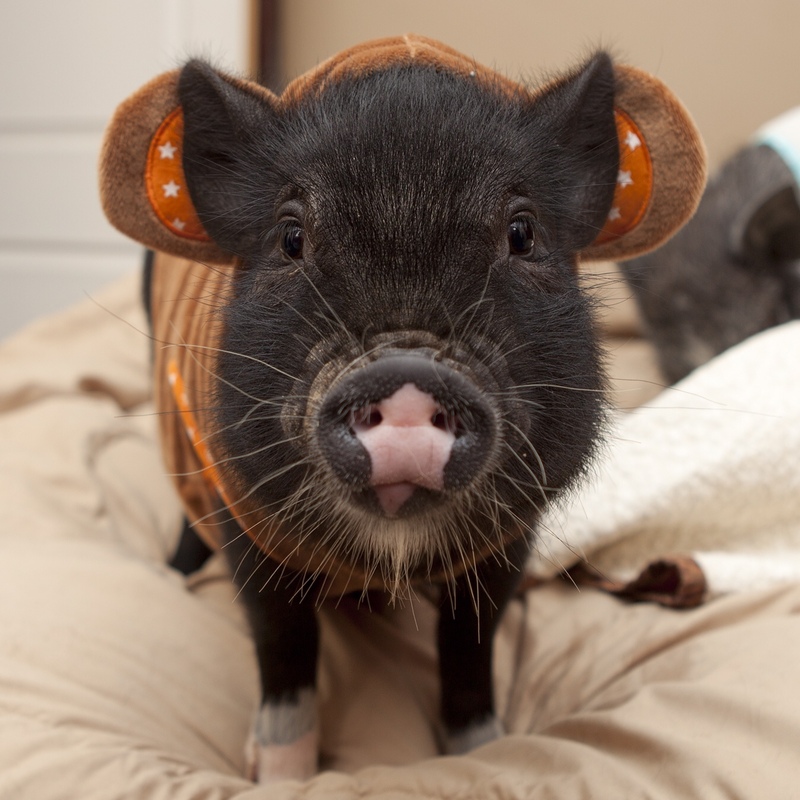 This is the best time of year for potbellied pig owners, as your friends, family, and neighbors throw out their jack-o-lanterns and start prepping for Thanksgiving and Christmas holidays. Pippy’s very own pumpkin; it took her 3 days to eat! 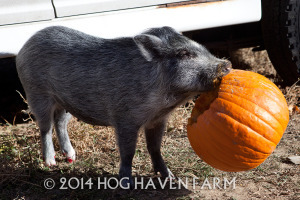 Pumpkin has huge health benefits for pigs; not only is it a good source of Vitamin C to boost immune systems, it’s rich in fiber as well; this is important to help our infinitely-hungry friends feel full longer! Pumpkin, when cooked and mashed, is also a good source of Vitamin A, a key ingredient for aiding vision in both humans and our porcine pals. Pumpkin is also a good option to aid digestion in pigs–when your pig has an upset tummy or is showing signs of constipation, feeding them cooked pumpkin works wonders! So ask around this weekend for unwanted jack-o-lanterns; your piggy pals will thank you! It’s been a while since we’ve posted anything about our rescue pig, Pumba, so we thought we’d share a little about how this fella is doing! 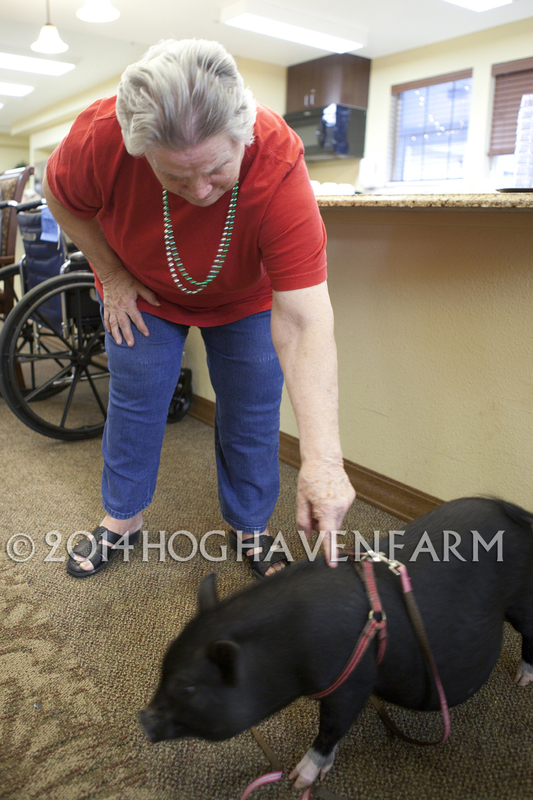 In April of 2014, we were approached by a memory care facility in Littleton, CO about the possibility of bringing the pigs in as therapy pets for the residents. Many of these residents are in different stages of Alzheimer’s or dimensia, and of course we leaped at the opportunity to bring happiness to the facility! 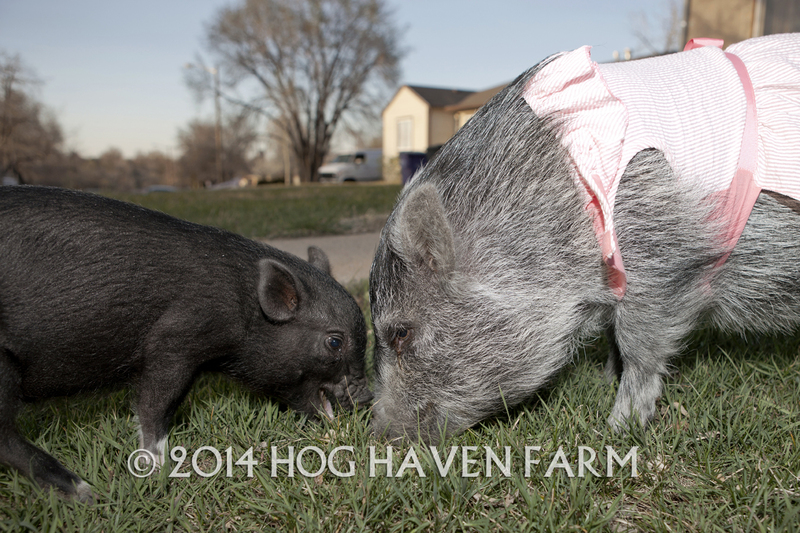 Starting in May, Pippy and Boris started visiting the facility on weekends. 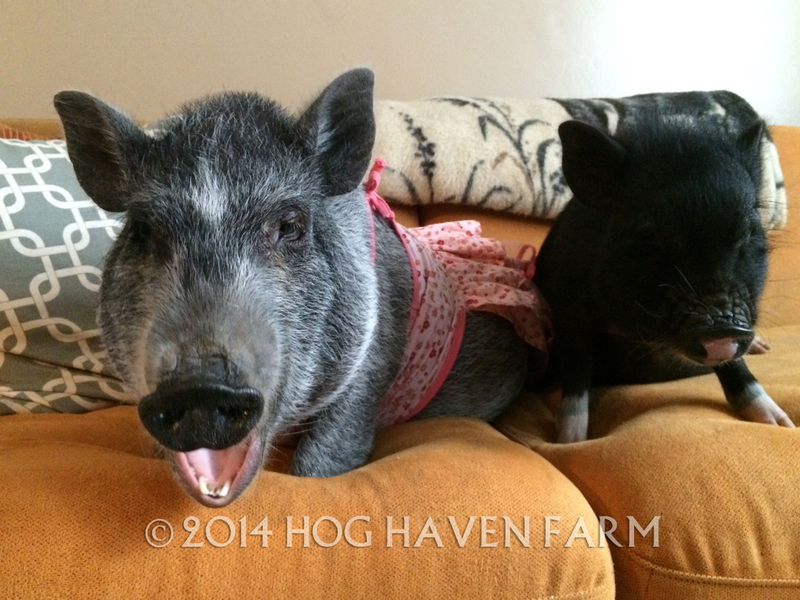 It has been an incredibly rewarding experience; the reception of visiting potbelly pigs has been incredibly positive, and Pippy and Boris thoroughly enjoy their weekly visits.Our pigs are very well behaved; they are both potty trained, and are incredibly social with strangers. This makes them a great fit for visits to the facility! Boris getting some scratchin’s from a resident in August 2014. During these one hour visits, Pippy and Boris get lots of attention, snacks, and extra belly rubs. It’s a wonderful feeling seeing the faces of the residents light up when the pigs come to visit! Pippy even dresses up on occasion, guaranteeing an extra smile (and sometime a treat!) from the residents. 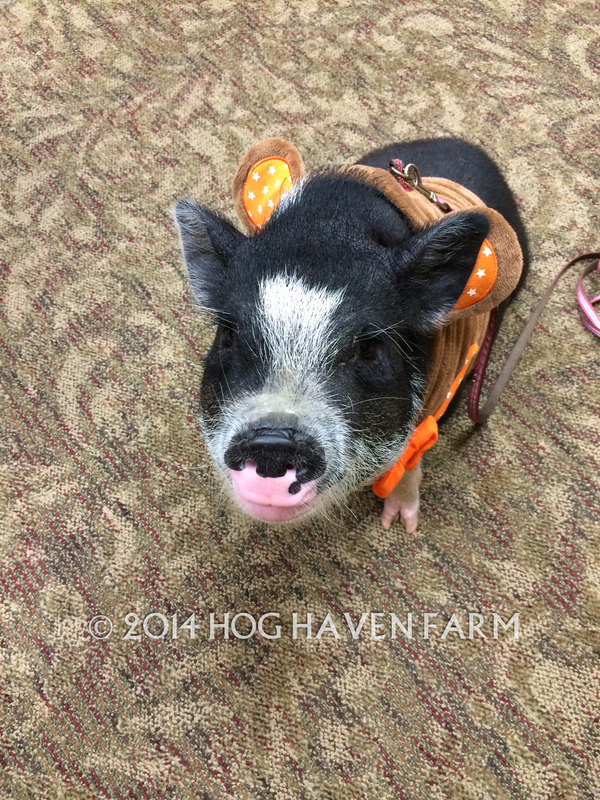 We are in process of setting up the pigs as therapy pets in other facilities, and welcome the idea of bringing them to schools and other organizations in the future. Education is key, and at Hog Haven Farm, we are dedicated to inspiring others to not only help these wonderful animals, but to teach others about how well suited potbelly pigs are as a family pet. 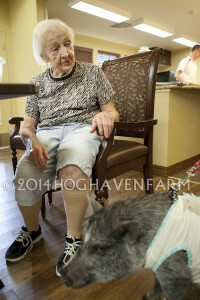 Pippy is dressed up and looking for treats with one of the residents! 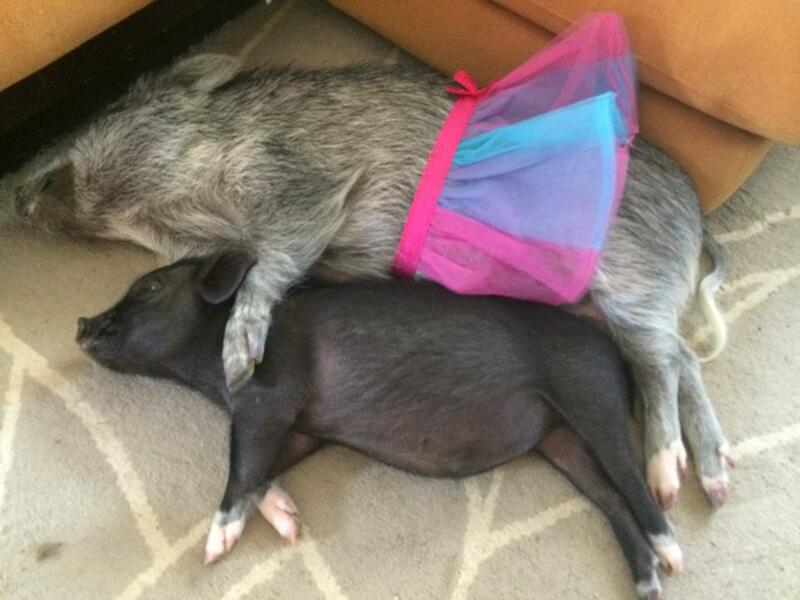 Currently, Pippy and Boris are not officially certified as therapy animals. With our community service hours growing, and consistently good bills of health from the vet, we are looking to have them certified by the end of 2014. 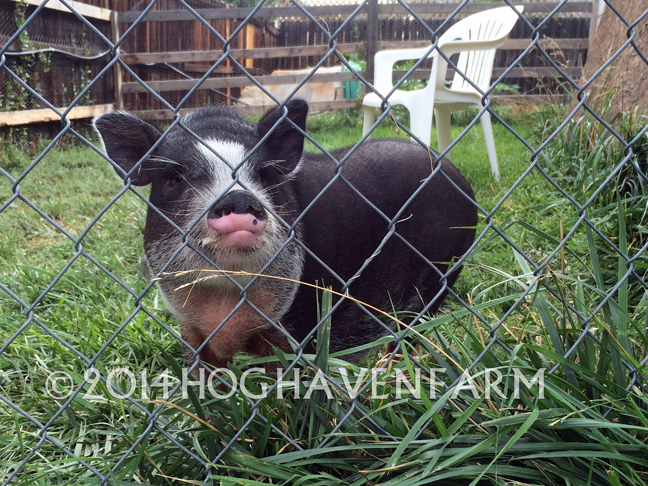 If you or your organization would like Hog Haven Farm to pay a visit, please contact us at info@hoghavenfarm.org today! Pumba has recently fallen in love with the piggy pool. Check out this cute video of Pumba “swimming”! 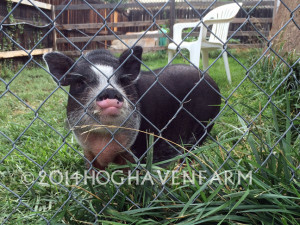 In mid-August, Erin and Andrew decided to bring home their first rescue pig. Pumba was living north of Denver, Colorado, with a family who could no longer keep him. Pumba was born in April 2014, in Kansas, and adopted at roughly 8 weeks of age. His family starting bringing him to a farm vet, who poorly advised them on proper diet. Thus, Puma developed a weight problem and incredibly dry skin. 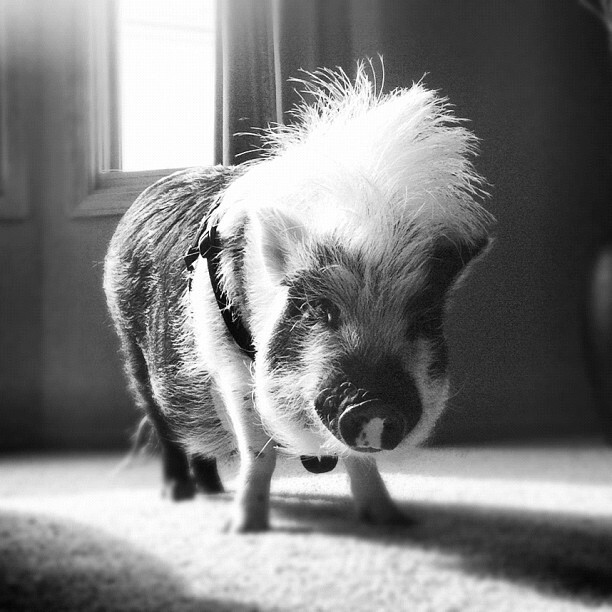 At 4 months old, the time of the rescue, Pumba weighed approximately 25lbs and was larger than Erin and Andrew’s 10month old pig, Boris.